The following study was recently published in the Journal of Gastrointestinal Surgery by Ammar A. Javed and colleagues in September 2018. Below is a summary of the article. 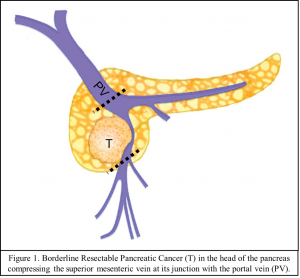 Localized pancreatic cancer can be classified into resectable, borderline resectable and locally advanced lesions based on the degree of involvement of adjacent blood vessels (portal vein, superior mesenteric artery and celiac artery). Borderline resectable tumors are those that have limited invasion of the vessels and, while surgically resectable, carry a high risk of positive margins at the time of resection (see prior Nikki Mitchell Foundation article on margin status). Chemotherapy available for pancreatic cancer has improved significantly over the last decade. With effective therapies now available, a majority of patients with borderline resectable disease now receive preoperative chemotherapy. The authors sought to evaluate the outcomes of patients undergoing surgery for borderline resectable pancreatic cancer at a single high-volume center. The authors identified 151 patients from their multidisciplinary clinic who were diagnosed with borderline resectable pancreatic cancer. 142 (94.0%) patients received chemotherapy and 78 (51.7%) received radiation therapy. Ninety-six (63.6%) were able to undergo surgery, while 12 (7.9%) patients were taken to the operating room but their procedure was aborted due to extensive disease. 47 (31.1%) of patients unfortunately had progression of disease and were deemed to be unresectable at follow up. Patients who underwent surgery had a median overall survival of 28.8 months as compared to 13.5 months in those who did not receive surgery. 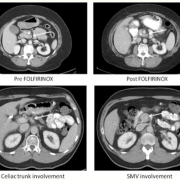 Multidisciplinary management is vital for borderline resectable pancreatic cancer. Resection of borderline resectable pancreatic cancer is safe when performed by experienced surgeons at a high volume institution. The rate of resection in patients with borderline pancreatic cancer is approximately 65%. 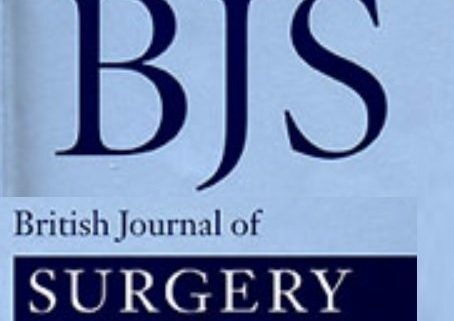 Surgical resection of borderline resectable pancreatic cancer is associated with improved overall survival. Disease progression while receiving chemotherapy is the most frequent reason for unresectability. A special thanks for this summary by Michael Wright, Department of Surgery, Johns Hopkins School of Medicine and Dr. Ammar Javed for his support. 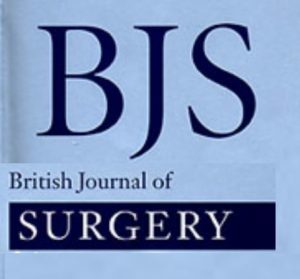 The following study was recently published in the British Journal of Surgery and below is a summary of the article. Validation of at least 1 mm as cut‐off for resection margins for pancreatic adenocarcinoma of the body and tail. Hank, T., Hinz, U., Tarantino, I., et al. One of the major goals of surgical resection of a pancreatic tumor is to clear the body of all local disease. A resection margin is the outer edge of the tissue that was removed. The margins of the resected specimen are reviewed by the pathologists and should ideally be free of disease. Traditionally, R0 represents no cancer at the margins, while R1 represents microscopic disease at the margin, and R2 is representative of gross disease at the margins (seen by naked eye). In recent times, the topic of an R0 resection with disease located within 1mm of the margin has gained interest in the surgical community. Using an institutional database, the authors identified 455 patients and classified resection status as either R0, R1 less than 1 mm, and R1 direct. An important aspect of the study was that the authors not only analyzed the survival rates of all patients but also studied trends of survival in patients who received postoperative chemotherapy. Since postoperative chemotherapy is known to be related with survival, the authors wanted to demonstrate that margin status was independently associated with improved survival. The results of the study confirm the importance of resection margin as they independently predicted survival in these patients regardless of their postoperative chemotherapy status. In particular, the survival benefit of clean resection margins beyond 1mm are highlighted. The differences observed in all reported median survivals were statistically significant. Note: published data suggests that the same findings hold true for Whipple procedures. In short, R0 resections are associated with improved survival of all pancreatic adenocarcinomas, regardless of pancreatic surgery type. 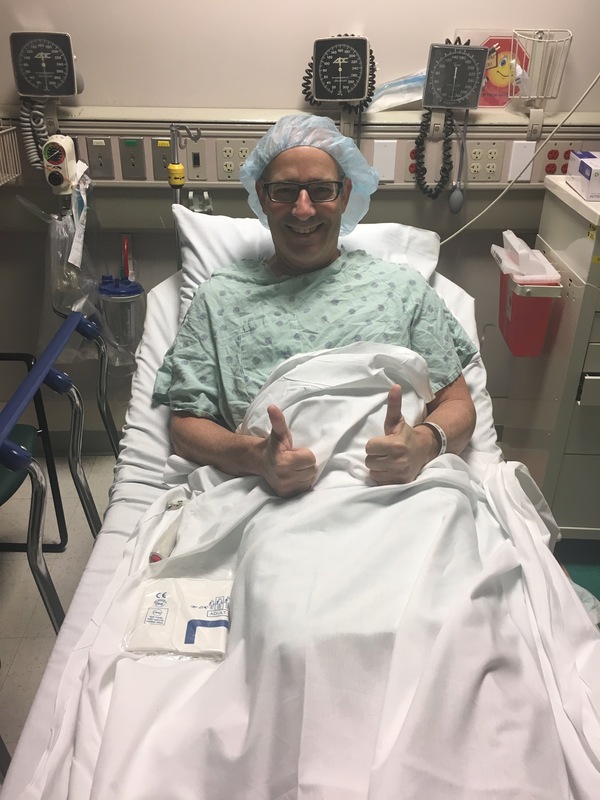 In August of 2017, at age 55, I was diagnosed with pancreatic cancer. Five years earlier my mom passed away from the disease so I knew what lay ahead of me. 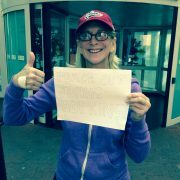 When I met with my oncologist he said, “We’re talking cure, not life extension.” My surgeon at Johns Hopkins said, “We got this.” I knew the statistics but after hearing how optimistic my care team was…how could I not be?! Over the next few months, as I went through the chemo, radiation and all the side effects, I remained absolutely optimistic and positive. I refused to allow negativity, anger or sorrow into my thought process….as these were counter-productive to my desired outcome. Along with a great care team, and just as essential, I had amazing support from my wife, kids and community (near and far), providing me with a lot of comfort. March 16, 2018 I had my Whipple surgery. Everything went smoothly and as of now I’ve made a rapid recovery. 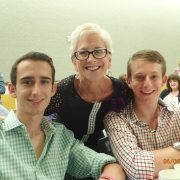 I take great pride in saying that I am a survivor of pancreatic cancer….something too few people get to say. What has become abundantly clear is that the past is past. The future is not here yet and all we have this moment. I am very much living in the moment and every day find something to appreciate or amaze me. I find it ironic that palliative care was recommended to Nikki very near the end of her life and the conference pushed this presentation to the very end as well. 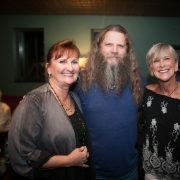 Nikki and I spoke many times about the need for palliative care early in a cancer diagnosis. Why not utilize all avenues to strengthen and improve your quality of life and build up a support system? I believe doctors and patients lack education on this extremely important and helpful type of care. So, what is Palliative Care? PALLIATIVE CARE IS “NOT” HOSPICE CARE. Myth: Palliative care hastens death. Myth:Palliative care is only for people dying of cancer. Myth: Palliative care is only provided in a hospital. Fact:Palliative care can be provided wherever the patient lives: home, long-term care facility, hospice or hospital. Myth:Taking pain medications in palliative care leads to addiction. Myth:Palliative care means my doctor has given up and there is no hope for me. 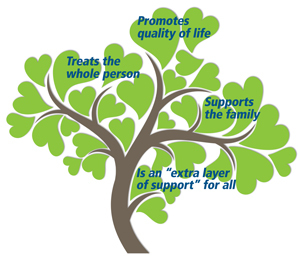 Fact: Palliative care ensures the best quality of life for those who have been diagnosed with an advanced illness. The last myth is a big pet peeve of mine. I have heard people comment, “If your doctor mentions palliative care, then get a new doctor.” They think this means the doctor has given up on them, but this is flat out incorrect. If a doctor recommends palliative care, then you have a progressive doctor seeking to treat the whole person and ultimately, their loved ones. That is the kind of forward-thinking doctor I’d want for myself. This type of care treats pain, depression, shortness of breath, fatigue, constipation, nausea, loss of appetite, difficulty sleeping, anxiety and any other symptoms that may be causing distress. The doctor will help you gain the strength to carry on with daily life and improve your quality of life. For more information on palliative care, click HERE (scroll to the end) and HERE.